As a mother of four, Heather Porter knows what it is like to watch your body fall apart after pregnancy. Over the years, she searched for a single manual for the female body, a mother's encyclopedia. When she could not find anything like it on the market, she set out to write it herself. Heather recalls, "For me, it wasn't just about shedding the pregnancy pounds but about learning how to be attractive and healthy, both emotionally and physically again." What followed was a journey of self-improvement, with plenty of highs and lows along the way. She tried the A-Z of exercises and treatments, some resulting in hilarious stories, from spinning to colon hydrotherapy, from yoga to wheatgrass drinks. Heather kept a diary that documented her thoughts and experiences and noted what worked and what didn't. By sticking to her regime, she began to reap the rewards as the pounds shifted and her overall well‑being improved. 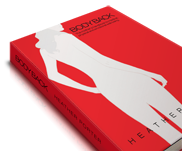 Body Back draws together fifteen years of Heather's personal experiences, including working with professionals from various fields of expertise, many of whom have contributed to this book. "This is the book I needed when I had my first child; my only regret is that I didn't write it until I had my fourth."